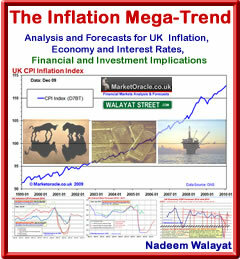 The British economy is in the midst of a deep debt crisis that risks a collapse into a hyperinflationary bust. The root of the problem lies in the fact that the government spends £180 billion more on public spending than it earns, i.e. government revenues are £500 billion, and government expenditure is £680 billion (2009-10 est). The deficit of £180 billion is at 14% of GDP and is not sustainable that requires an urgent and near immediate cut in the deficit to below 6% of GDP to prevent igniting an out of control inflationary debt spiral. Both political parties have pledged to ring fence NHS and Education budgets for growth. However these promises are NOT possible given the fact that these are two of the largest spending budgets, therefore it would be impossible for the government to achieve the cut in the deficit without also cutting these budgets by at least 4% and possibly as high as 6%. Even if all of the proposed cuts detailed in the earlier analysis (UK Public Spending Deficit Debt that Risks Bankrupting Britain ) did take place, Britain would still be in for tough times during the next 5 years. However without cutting the big spending budgets then there is no way the country can bridge the huge deficit where each months deficit is added to Britians' debt mountain the size of which would risk a currency and economic collapse into hyper-inflation Iceland style. The following list of Sheffield GP Surgeries is from the data compiled by the Department of Health funded UK GP Patient Survey conducted by Ipsos MORI during early 2009 that sent out a questionnaire to 5.7 million NHS GP patients and therefore comprises the most comprehensive data available as to patient feedback of actual experience of using GP Services. In total 57,759 questionnaires were sent out to Sheffield patients of which 24,696 were returned or 42.75% (click here for a sample survey). Out of the full list of 91, the follow represent the bottom 10 performing GP surgeries in Sheffield as per the UK GP Patient Survey some of whom could be singled out to be cut, which ironically may result in improved healthcare for the patients as they are transferred to Sheffield GP surgeries ranked by a higher patient satisfaction percentage.